Prosecutor: We’ve carefully delineated each violation with specific graphic evidence on Days 1, 2, and 3 of the trial. The evidence is so overwhelming, you might have trouble keeping it straight. Luckily, there’s a quick, easy way to review the cumulative evidence and reach a verdict. 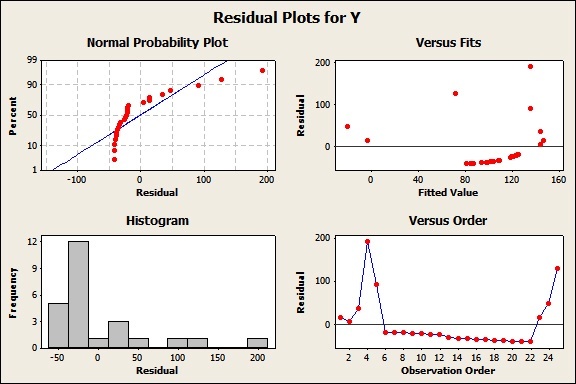 When you run regression analysis in Minitab's statistical software, simply click Graphs and select Four in One. Prosecutor: Of course, the defendant didn’t bother to try that, either. And he had many other opportunities to amend the error of his ways. 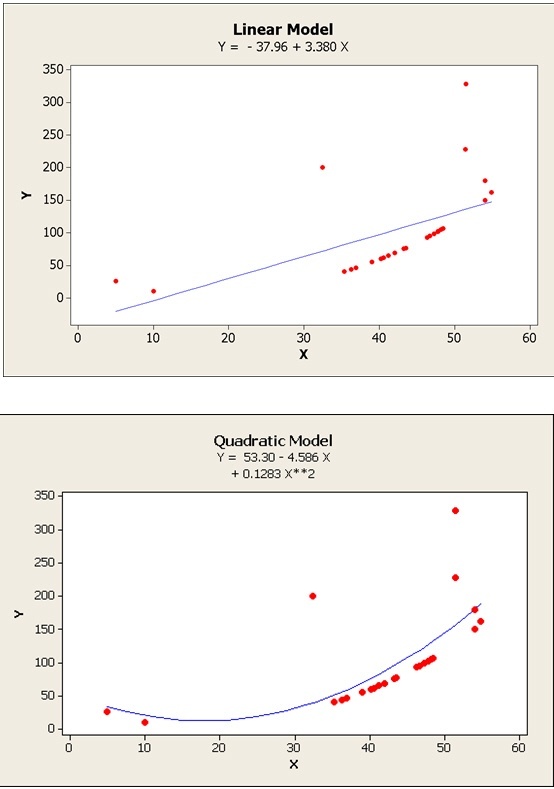 For example, using Regression > Fitted Line Plot, he could have changed his model from linear to quadratic to better account for the curvature in his data. Prosecutor: What's more, he could have right-clicked a graph and chose Brush to identify and investigate outliers in his data. Prosecutor: But he didn't do that either. In short, Minitab gave Lionel Loosefit all the chances in the world. Why did he not avail himself of any of these opportunities to take the high road? 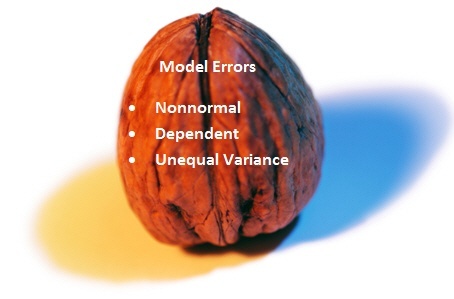 To follow the basic tenets of statistical decency? Prosecutor: I’ll tell you why, ladies and gentlemen. Because Lionel Loosefit has absolutely no residual shame!!!! Prosecutor: And for that reason alone, you must find him guilty on all counts! …hammertoes, bubonic plague, sudden bouts of belly-dancing, foot-in-mouth disease, triple vision, and short-term paralysis of the index finger." Did you catch that last one? Short-term paralysis of the index finger, ladies and gentlemen. 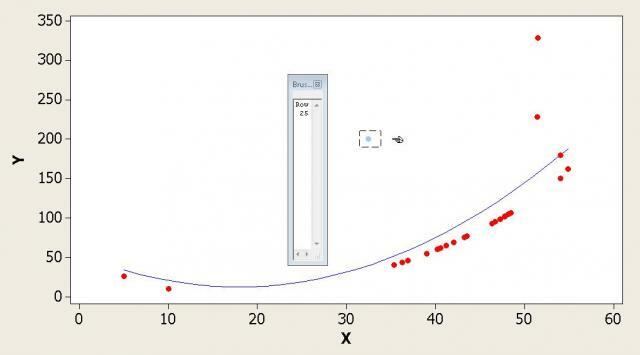 Making the defendant temporarily unable to click Graphs > Four in one, or another other options to evaluate regression assumptions in Minitab. Spectator [whispers]: Is that all they got for a defense? Salt on the brain? Think back, everyone. Almost exactly one year ago to the day. February 19, 2012. The Knicks vs the Mavericks. Madison Square Garden. Game time started at 1:00 PM ET. Prosecutor: Objection, your honor. This is highly irrelevant. Judge: Sustained. Counsel, get to the point. Defense: Your Honor, like many of us, Mr Loosefit has two monitors at his work station. On one monitor he was performing a regression analysis using Minitab. On the other monitor, he was watching Jeremy Lin score 28 points and tally a career high of 14 assists and 5 steals. Judge: It appears that the defense rests. Judge [to jury]: Have you reached a verdict? Jury: We have, your honor. We find the defendant guilty on all charges. Judge: Mr. Loosefit, I’m not 95% confident that we can accurately predict your future responses. That’s why I want to make sure that you don’t have even one degree of freedom to estimate a model, ever again. Judge: I hereby sentence you to 30 years of hard labor, calculating all the statistics for each regression analysis yourself…without using Minitab. You’ll be calculating coefficients and plotting residuals for the remainder of your days, Loosefit. And to make doubly sure you learn your lesson, I’m denying you access to the calculators in Calc > Calculator or even the Tools > Calculator. All your calculations must be done by hand, including long division! Generation X spectator: “Long division”? What’s that?! Generation Y spectator: Sounds like some kind of sadistic medieval punishment. Generation Z spectator: Didn’t they outlaw that at the Geneva Convention? Judge: But I'm not without mercy. I won't make you search for every formula in a statistics textbook. 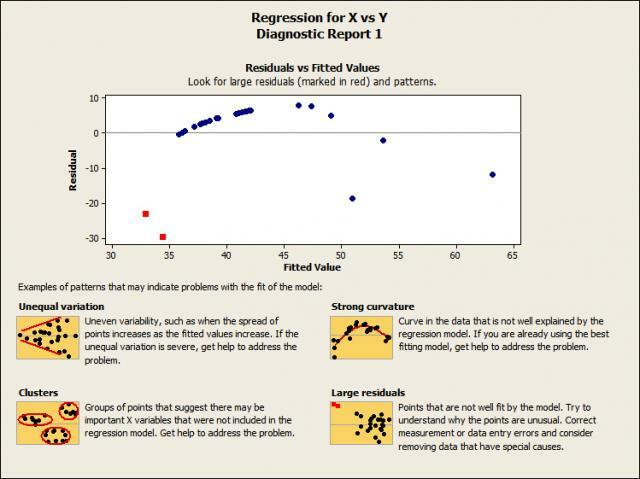 You'll be allowed to use Help > Methods and Formulas > Statistics > Regression. You'll find all the formulas you need there. Loosefit: No! NO!! Not long division! Okay, I confess. But it was my p-values that made me do it. I wanted to feel statistically significant! Judge: Statistical significance doesn't mean jack diddly if your model assumptions aren't met. Bailiff, take Mr. Loosefit away. Update: Since his sentencing, Lionel Loosefit has undergone a power transformation in prison. He now works for the benefit of the public good, making sure that others remember to use Minitab to check their assumptions whenever they perform a regression analysis.